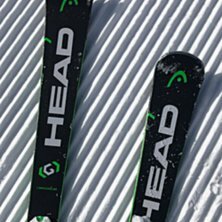 What do you think about Head SUPERSHAPE MAGNUM? Great ski for those loving to carve. Also good at short turns. Love being on their edges. They are fast, perfect on icey slopes but at the same time can handle various difficulties too, even in powder super easy to manuveur! They are little bit heavy at the beginning until you get used to them. I am super happy ! I care for them and love to ski with them on any kind of slope! Most of all Great fun. Not demanding for me at all, yet Expert level performance comparable to heads racing dept skis. Carving- sticks a carve like nobodies business, with great feel underfoot. Great on hard snow, or a little chop and freshies. My skis are Limited Edition Franz Klammers for the Vail American Ski Classic, which I believe are Supershape Magnums under the tops (without a chip). I highly recommend the Magnum... it sure impresses me... worth a test anyway if your Ski shop offers Head Demos. For rec racing, and bomber turns, I am dying to try the Supershape Speed, which could make a great stable mate to these. A ski to rely on. When you trust your own legs, just hang on, the ski will take you wherever you want. Have tested and used 156 cm of skis, but can imagine a snap of longer skis and enhanced experience. Very easy-to-handle, with good technology, and also works in more relaxed driving with the children at a slower pace. Soft, wonderful turns that make you happy ... Easy to control in the ride and speed - high or low, just to choose. I'm able to certify the mentioned ice grip and the kick out of the turn. Have tried the offpiste ... quickly skipped from there to the nearest piste. May depend on practice and experience to some extent, but rather use other skis to do so. The new favorite ski slope has to be "bass" when I mostly stay in a pisted terrain. Requires complementary skis if you want to go out in the terrain - which will be my option when I'm completely in love with the skis ... no allmounties here! Riding style: Ffa pist, little pillows. Really nice skiing with good pressure in the turn, up for years v.13 and pressed. Works really well in a bit harder pist but also incredibly good to drive the sorbet with. Strong recommendation !! However, I think you should be a good skier to take advantage of the ski and make it worth its price. Personally, I'm a lot of heavy skis, because I'm a big speed fan so the minus may be that they were slightly easy for my taste in terms of weight. Have a good slide, which you can have fun with pushing it to the maximum. Suits well as pair 2 or 3 in the collection. Should you only have a pair of skis, I would recommend a pair with a larger radius and a bit heavier .. I will easily buy these for next season !! Ready hard pistade picks in high speeds with bravur. Very nice and light skis. The carving really gave an extra shot out of the turns. The swing radius of 13.5 meters was a big plus. The cushions / pillows were not as nice to go in. Really good skiing, worth every penny! Is very pleased with the ski, but the price difference between XRC 800 and SHAPE is not defensible. Wonderful carving ski with wide range of use in the piste. Have tested the skid (both 156 cm and 163 cm) on several occasions during the past week. The week has included family skiing in flat slopes as well as own rides in harder steep (black) slopes, and the ski has worked well in all modes! Good cut in calm speed and still speed stable with a sustained bite when I lay on a lot more. Very impressive! By comparison, I can say that I also tested Atomic Race SL 11 (156 cm) during the week. The Atomic skid worked very well when I lay on, but felt too hard for the quieter family pace. Not as wide as the Supershape. For me, a 163 cm Supershape would be a perfect option for both skating and for development. Really stable and consistent piste skiing. Works really well in short and long turns but is a bit more demanding for the legs. (could barely jump on afterskin the other day). Inann yes, I bought them my requirements that they would not flatten, manage short turns and the layer was beyond my expectation. On the ice they are just pushing down the steel edge a bit extra so you get a really good ice grip. A perfect ski for those who like to drive fast in the piste and still feel the stability. even for those who love to let the carving work in short turns. Before I have gone on atomic slc 9.2 with radius 11. The superhigh was both faster and more consistent in the piste.